The table is set, the company is about to arrive for holiday dinner, and your child has just disappeared into her bedroom with a stomachache. Are you aware that this may be an early warning sign of an eating disorder? Eating disorders afflict 8 –10 million Americans, 87 percent of whom are adolescents and children. Younger children are becoming increasingly vulnerable, as the average age of disease onset has recently dropped from 13 to 17 to 9 to 12. A recent study reported that 40% of first graders surveyed were dieting. Food restriction and the fear of becoming fat, secretive eating and body image concerns can signal an impending eating disorder in your child. Early detection can nip a growing problem in the bud. Parents do not cause eating disorders, but they can and must be instrumental in detecting early signs and procuring timely and effective treatment as advocates for recovery. As the leaves turn colors and frost covers the landscape at dawn, Thanksgiving and Christmas are in the air. The upcoming holidays offer families an opportunity for togetherness and joyful interaction; there is no better time to observe a child who may be struggling with food and weight issues, as well as related emotional problems. 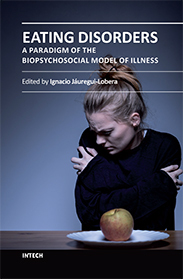 Eating disorders are the behavioral tip of an emotional iceberg, the misuse of food to resolve emotional problems; it is safe to say that their appearance is an indicator that a child is struggling with problems of self esteem and self regulation, with self-perception, judgment, and problem-solving. A child’s dread of family gatherings or reluctance to spend time eating with loved ones, or in public, to mark celebratory times may be a dead give away that the child is suffering. These signs must be considered a parent’s call to action. Remember that eating disorders are more likely to show up at home, in kitchens, bathrooms and bedrooms than in doctors’ offices, in physical examinations or in laboratory tests. Like it or not, parents are the most effective diagnosticians and provide the first and best line of defense. Bringing his or her own special foods to family events. Restricting the amounts, types, or food groups eaten. Demonstrating food quirks such as drinking lots of water before meals, cutting food up into tiny pieces and pushing them around plate, chewing food and spitting into a napkin, eating the same foods every day, demonstrating rigidity about times to eat or the order in which food is consumed. Complaining of stomachaches or other physical symptoms before meals. Disappearance into the bathroom during or immediately following meals. Parents and families must understand that the malnourished child afflicted with an eating disorder or with behaviors that mark precursors of eating disorder onset hasn’t the judgment or accuracy of perception to acknowledge that these concerns exist, nor to assume any degree of self-initiation or control in seeking solutions. Many youngsters do not understand what healthy eating actually is. By taking charge of the situation where their sick child is incapable of doing so for herself, parents educate, nourish and prepare their child to eventually resume self-regulation and self-determination Taking charge of a situation is not synonymous with taking control of the child. Do not confuse appropriate parenting interventions with intrusive parenting. Intervene intelligently, knowledgeably. 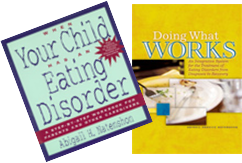 Confront the child with your observations and concerns, with the dangers of ignoring an impending eating disorder. Defining a problem is the first step towards finding a solution. Know thyself. Parents must understand that one’s own issues regarding food and weight could inadvertently interfere with the ability to accurately assess or respond to a problem in their child. Don’t be afraid to be your child’s parent. Your child needs your support and guidance now more than ever. In seeking professional help, look for clinicians who will welcome you as an intrinsic part of the treatment process and team, who are willing to involve the total family in treatment and in creating and living a healthy lifestyle. Not all eating quirks, disordered eating, or food fears are precursors to clinical eating disorders. When youngsters misuse food in an effort to resolve emotional problems, parents have cause for concern. By recognizing an eating disorder and tending to the emotional problems that underlie and drive it, enlightened and empowered parents contribute to healing the total child. When not part of the solution, parents are in danger of becoming part of the problem.